Virtual reality (VR) is the latest fad in Bergen: The national theater DNS is putting on a stage play that focuses on digital technology in the future, and where VR can take us. 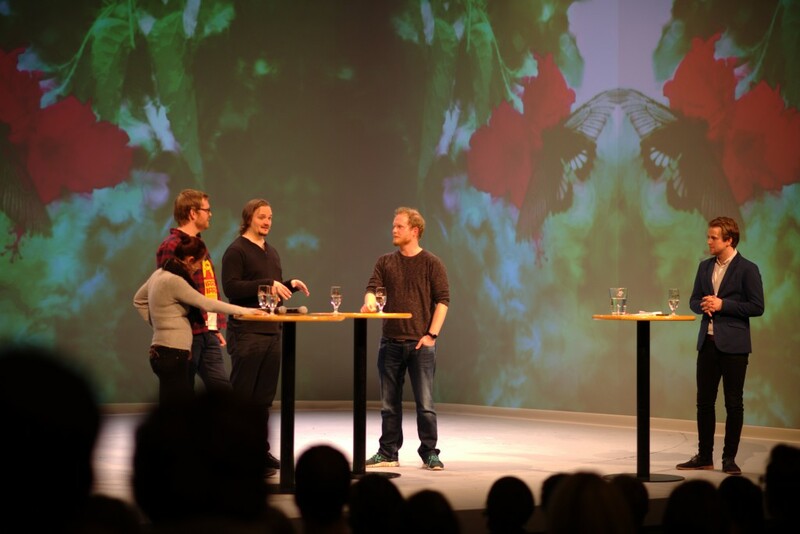 DNS invited the rest of Bergen to a panel discussion about VR in games, and over 200 people attended. 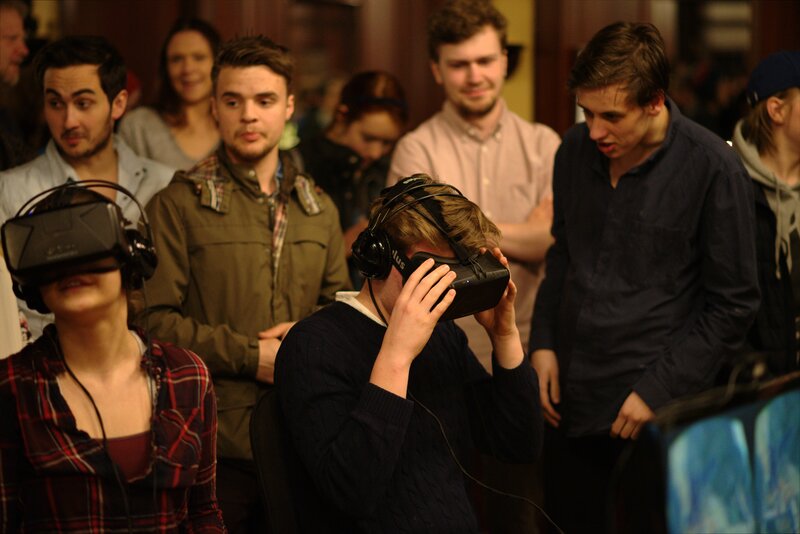 Central to the debate about VR in games was our CEO Peter. As one of the founding members of Rain, he has a lot of ideas on how you can utilise VR in games. Joining him in the debate were other game enthusiastic shakers and movers in Bergen. Tobias Staaby is a teacher with great success in incorporating games in school education. He often uses The Walking Dead from Telltale Games when teaching ethics and philosophy, and Portal 2 from Valve to teach physics to the students. The third contestant was Rune Mentzoni, who specialises in abuse problems related to digital gaming. And while that might sound like a ‘buzz-kill’, his overall point of view is that games are inherently good fun. Lastly, we had Kristine Jørgensen from the local University. She has previously specialised in user interfaces in games and is currently researching Games and Transgressive Aesthetics. The pros and cons of VR were a hot topic, and to great entertainment for the 200 people attending, Peter had a lot of ideas about the possibilities of VR in games. While a lot of games are hits and misses when applied to VR, one of the better examples Peter observed was Lucky’s Tale. You play as a fox in a platformer game, not unlike Super Mario 64. The VR headset lets you observing the model you control from above. The camera slowly glides along with the character as you progress the level. VR is so good for this game as it is much easier to judge distance when you are making jumps. Tobias was quite interested in how VR could be used to show people architecture. If his students could somehow put on a VR headset and then be inside the Notre-Damme or the Parthenon, it will have great educational potential. Kristine was the only one critical of VR games. She has a great belief for VR in other fields, like for instance surgeons performing operations from afar (this would, of course, need some other technology supporting it). It would bad to just take established video games genres and expect them to do well in VR. However, Kristine was looking forward to the types of games that grow out of the VR movement, once the industry learns which kind of experiences work better using the various headsets. One thing that all the panel agreed on is that the price of VR headsets have to go down before the gamers can start buying them. When the VR headsets cost the same as buying both a Xbox One and a PlayStation 4, they better offer a good experience once you ‘pass the threshold’. After the debate, Rain and Henchman & Goon (good friends of us) demonstrated VR for the 200 attending. We have everything, from Posh high society to young avid gamers. With only 3 VR headsets and all 200 wanting to test VR, we were there all night. Peter said onstage that people trying VR for the first time should do it very briefly; by the time you notice you’re getting motion sickness it is too late! Very few listened to this advice… but they were happy none the less. The people working DNS needed to go home at midnight and asked us kindly to close the demonstration. The whole event was part of ‘Fritt Ord’ (translated as Free Speech), an initiative to make society more inclusive. In the last period, they have had a campaign called Digital Lives – New Facets of Gaming, that focuses on video games. This entry was posted in Events, Rain Team and tagged DNS, events, rain team, VR by Vidar Thorsby. Bookmark the permalink.